Some degree of restraint is clearly necessary and legitimate at the time of arrest or during transfer in order to prevent a detainee from escaping. However, once detention has been secured, there can be no legitimate need for artificial restraint. The use of shackles or leg irons is specifically forbidden by Rule 33 of the UN Standard Minimum Rules for the Treatment of Prisoners. In spite of this ruling, extreme and prolonged measures are very often taken. Sometimes an attempt is made to justify its use as preventing escape but usually they are applied to cause humiliation or as a punishment. The restraint may be continued for days or even weeks, far longer than needed for legitimate purposes. Handcuffs, wrist or ankle ties leave no mark if they are applied properly, and in some countries officers take care to prevent damage. In India, for instance, police often use the detainee’s turban cloth to bind the wrists or ankles. Conversely, restraints may cause abrasions or bruising even after a short time if they are of rough or harsh material or are applied too tightly. Thin ligatures tightly applied may cause deep wounds after a few hours. This type of handcuff, which automatically continues to tighten if the prisoner struggles, is particularly dangerous and can cause characteristic lesions. The use of leg irons is widespread in police stations and prisons. Pakistani prisons are particularly notorious for its use, often for long periods of time. They are used as punishment, as a means of extorting bribes and intimidating or humiliating prisoners. Often the rings round the ankles are roughly finished and cause severe abrasions and scarring which may be highly consistent with allegations of abuse. There are many forms of positional torture, all of which tie or restrain the victim in contorted, hyperextended or other unnatural positions, which cause severe pain and may produce injuries to ligaments, tendons, nerves and blood vessels. Characteristically, these forms of torture leave few, if any, external marks or radiological findings, despite subsequent frequently severe chronic disability. Positional torture is directed towards tendons, joints and muscles. The ‘five-point tie’ is a technique of trussing up a captive used in several African countries. A single fine rope is tied round the wrists, ankles and neck or mouth, holding the trunk tightly in extreme extension. An attempt to relieve the pain by moving one limb tightens it more around the others. If this type of restraint is continued for any length of time there is almost certain to be permanent scarring and perhaps peripheral nerve or vascular lesions. In China, many forms of shackling are used as punishment and are given nicknames to disguise the appallingly painful methods used. For instance, Su Qin bei jian (literally, ‘Su Qin carries a sword on his back’) describes the shackling of one arm pulled over the shoulder to the other which is twisted behind the back. Another is liankao, describing various methods of shackling the hands and feet behind the back. Cramped or distorted postures or prolonged standing are used routinely in many countries. An example is Israel, where ‘moderate physical pressure’ is permitted by law. Several techniques have been devised by the General Security Service (Shin Bet) and routinely used to put detainees under undue stress. 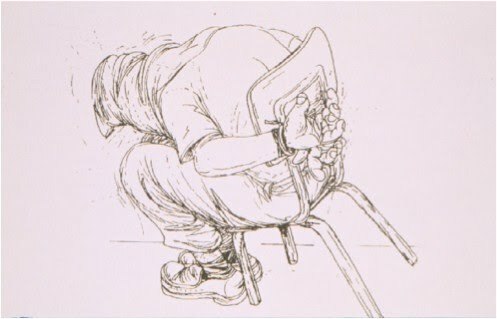 In shabeh the victim is shackled for hours to a low chair whose front legs have been shortened so that the detainee must constantly struggle to avoid sliding off. Shabeh is usually combined with methods of abuse, i.e. placing an often filthy sack over the victim’s head, exposing him or her to loud music and sometimes to extreme temperatures and sleep deprivation. In gambaz the detainee is forced to crouch on his toes in the ‘frog’ position for long periods. In kas’at tawila the subject is made to kneel with his back up against a table and his cuffed arms resting on the table behind him while the interrogator’s legs push against his shoulders. A small chamber nick-named ‘the refrigerator’ is used to keep the victim immobile for hours or days. The UN Committee against Torture has determined that restraining detainees in very painful positions is by itself an act of both torture and cruel, inhuman or degrading treatment. 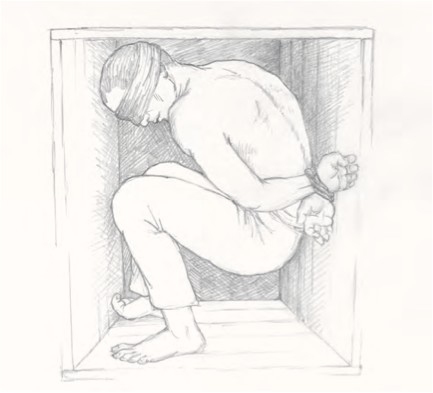 It recently determined that the use of “short shackling” by US (United States) personnel constitutes either torture or cruel, inhuman or degrading treatment and has recommended that the method be prohibited. In a review of US practises, the UN Special Rapporteur on Torture has condemned the use of stress positions on detainees by the United States as violating the Convention Against Torture. Broken Laws, Broken Lives pp. 100.